People call the Extension office and desperately want to know how to cure their Leyland cypress or red-tipped photinia from whatever is killing them so they don’t loose their privacy hedge. Or they want to know how to control running bamboo or wonder why the branches on their Bradford pear are breaking. It’s time to forget these and other troublesome plants and consider some new options! First rule in replacing pesky trees and shrubs is to think of diversifying your plantings to avoid the vulnerability of a monoculture to disease or insect problems. 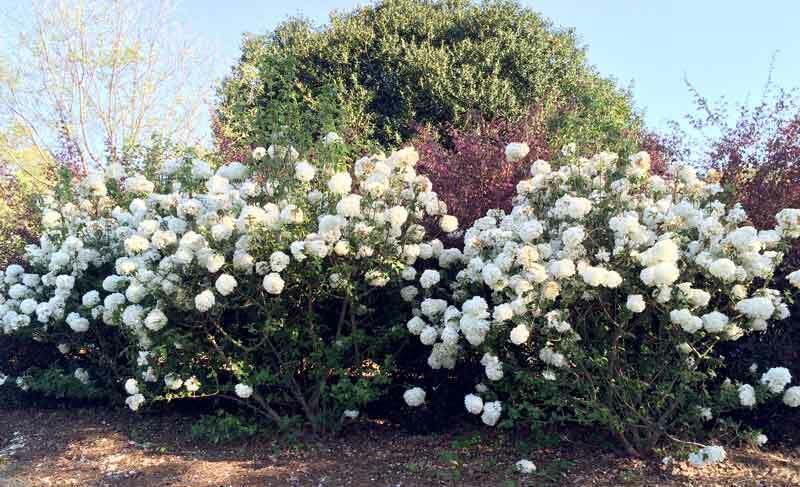 Plant hedges as a mix of three to five species and the chance of screening failure goes way down. Second, characterize your site in terms of hours of sun per day in winter and summer, soil moisture levels, and the desired mature height and width of the plants. Right plant, right place is the absolute key to minimizing disease and insect problems. Good replacements in full sun sites for Leyland cypress or Chinese privet, which is invasive, might include Arizona cypress (Cupressus arizonia), ‘Green Giant’ arborvitae (Thuja plicata), or the aromatic tea olive (Osmanthus fragrans). The tea olive and the lovely holly hybrids like ‘Nellie Stevens’ will create thick, impenetrable hedges once established or natives like yaupon (Ilex vomitoria) and wax myrtle (Myrica cerifera)) will support wildlife and put on berries for winter color. For a more columnar growth habit you might choose Chinese juniper (Juniperus chinesis ‘Spartan’) or ‘Emerald’ arborvitae (Thuja occidentalis ‘Emerald’). If your site has part shade, cleyera (Ternstroemia gymnanthera) will neatly thrive while the native anise tree (Illicium parviflorum) will be more vigorous and sprawling—and the crushed leaves smell divine. Camellias prefer some afternoon shade and will treat you to gorgeous late fall (Sasanqua varieties) to winter (Japonica varieties) flowers. Please replace those Bradford pears. They are invasive, stinky, and their crowded limbs are going to break eventually. For spring flowering trees why not enjoy our native eastern redbud, Cercis canadensis, or the Chinese redbuds, American plum (Prunus Americana), flowering dogwood (Cornus florida), or the fragrant fringetree (Chionanthus virginicus) that will feed songbirds with its fruit. 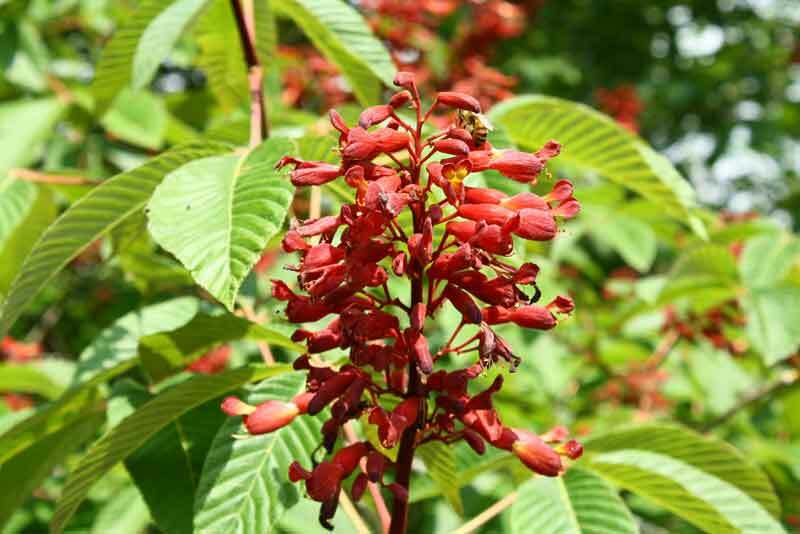 The red buckeye (Aesculus pavia) will attract hummingbirds in a part shade location. 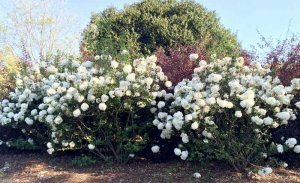 Deciduous shrubs like the Chinese snowball bush (Viburnum macrocephalum) can be showstoppers in your spring landscape. The smaller and more delicate fothergilla has white blossoms on bare wood in the spring and salmon-colored fall leaves that practically glow, while the yellow, fringe-like flowers of the witch hazel (Hamamelis virginiana) sprout in winter on bare stems. If you must plant nandinas (Nandina domestica) then look for sterile varieties such as ‘Firepower’ to ensure that seed are not spread invasively. There are so many stunning choices of plants that will enliven your landscape that I could only name a few. Rather than grabbing those familiar—and often problematic plants—know your site requirements and ask for plant options that will be happy there. You can get ideas by visiting local botanical gardens or check out the plants database from NC State University at plants.ces.ncsu.edu. And best of luck controlling that running bamboo! Featured photo – Buckeye by Jeana Myers.